Happy Weekend Everyone!!! How have you guys planned the weekend ? a lazy relaxed one or hyper active one? I know its a late post for me in the week , and i have never in my 2 plus years of blogging have composed a post at midnight. I am just back home from a fun filled Friday night party and the remaining weekend and the coming days looks so promising that if I don't squeeze in some time for this post now , it wont happen for some days. Well the dog days are here with heat waves just flaring up and it doesn't seem to budge any time soon. I couldn't appreciate the little cocktail book I have more than now, ever . What is the "two minute" wonder drink that keeps you refreshed and rejuvenated in this sultry weather? 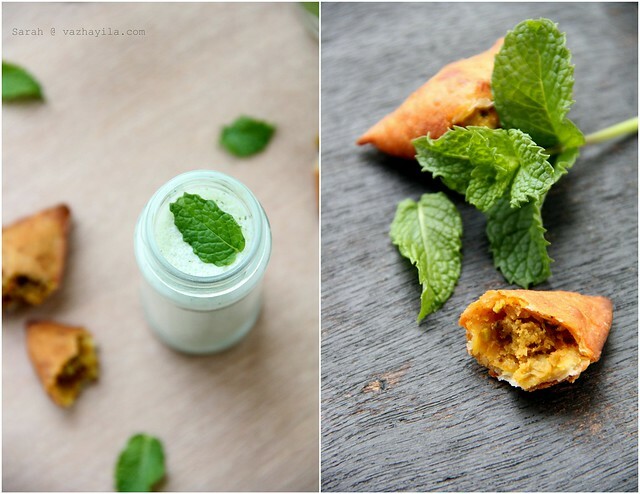 How about a spicy minty lassi with "store bought and fried at home" vegetable samosas to go with it? The recipe is from Madhur Jaffreys' and I made it with fresh green chiles and mint leaves from my lil garden. Instead, you can make it a bit more easily by adding 2-3 table spoons of store bought mint chutney too..How easy breezy is that? And trust me this is an awesome combo to serve to your guest too. wow! !innovative lassi....will try it...beautiful click! Lassi is always so refreshing..specially in summer. Absolutely refreshing and so cool and soothing for the eyes. Looks so refreshing. NIce clicks. Louvv mint flavour and lassis..Had tried your spiced buttermilk sometime back and it was yumm..Perfect for the scorching 45 degrees out here !! :) loved the first pic and green chilly in the last one looks 3d-ish..
Wow Sarah!! Stunning pics indeed..Loved the 1st,2nd,3rd,4th 5th pics..amazing!! Lassi recipe sounds very different. Will surely try it as my son has lassi every afternoon.. Delicious and refreshing drink...amazing clicks. Very innovative lassi...the snaps are looking good..
very innovative lassi !! so refreshing !! Looks so refreshing. Awesome pictures. A good looking drink indeed!! Such lovely clicks..love that mint click. And the lassie is really great for summer. how refreshing! Mint looks so fresh and health.. like ur new out look lady and happy sunday!! Such a refreshing drink and adorable clicks..
this clicks even have a cooling effect on me...lovely recipe. refreshing and delicious. What a creative lassi recipe! Great clicks. Looks absolutely gorgeous and perfect! a refreshing drink.. Loved the mint flavour in it..
after a long time i am visiting ur blog.so many non veg dishes u have posted, so couldnt comment on that. 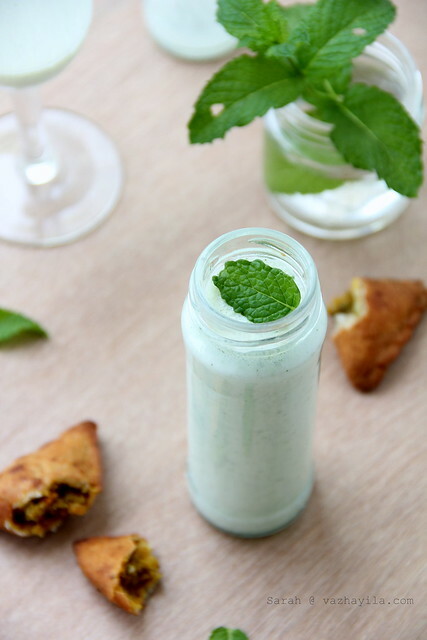 that is a very refreshing lassi...love the use of mint.. I love this idea! Beautiful photo and it looks like the perfect thing to end an impressive meal with! Wow!!! ende ponn Sarah, adipoli ayittond snaps. Lovely and too beautiful and perfect and ..... really no words to describe. Lovely post. 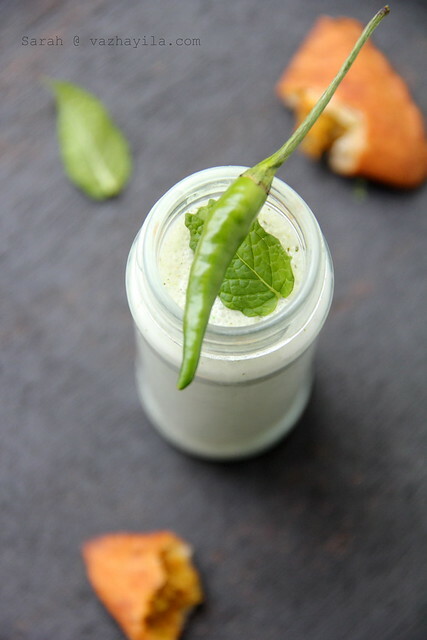 pale green spicy minty lassi adipoli. nammude sambaram pole undu. 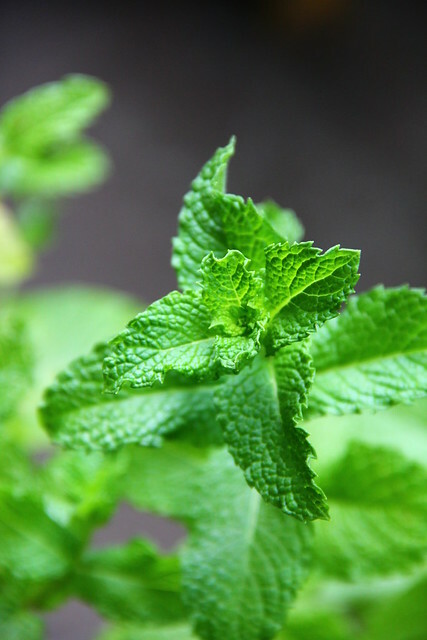 Mint...what a perfect way to flavor lassi. Love the color too, that pale green looks so refreshing. Gorgeous pics, by the way. Its my First Comment in ur Blog. Bcus I am new to this site. Lemme tell u somthin tht u r gifted, whether its ur recipes or the photography. Keep posting. Then why there is no seperate section for Pork Recipes? I wolud like to request you to do that for me. Hot yet refreshing delicious drink. Beautiful click. Love this type of flavoured lassi. Its cool.